included in this set is one Orbit and one Satellite 2.0 brown. CanadianCat Company® products are real natural products! Any cardboard box is a cats true dream. The idea for the production of scratch furniture and boards of corrugated cardboard is therefore almost ingenious. Especially since the corrugated board has an incredible stability. - CanadianCat Company® manufactures all products manufactures sustainable and environmentally friendly. Resources are spared to keep as low as possible to CO2 emissions. - CanadianCat Company® used the finest recycled corrugated cardboard absolutely free of formaldehyde in the highest quality and 100%. - CanadianCat Company® used only acceptable glues. - CanadianCat Company® products are odorless. - CanadianCat Company® sets the highest standards of design. All models are ergonomically designed. 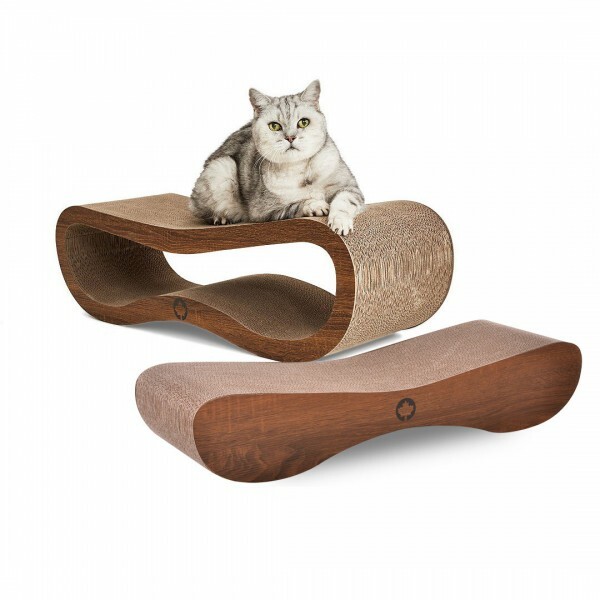 The particular solid surface structure also takes large loads on without a problem and offers the cat the ideal way to claw and scratch, no matter how big or heavy the cat is. Often there is little rivalry between multiple cats, if you keep more than one cat, it is advisable to provide a scratching board available for each animal. Lots of movement, games and fun are an important aspect for maintaining a healthy cat. A scratching board encourages in addition to the effective Nail Care also the natural playfulness of cats. CanadianCat Company® Scratching Boards are usually scratched at outstandingly hard. The shapely scratch boards Series 2.0 are available in brown and nature. links "Saver-pack Scratching Board, Cat Furniture Orbit + Satellite 2.0 - walnutbrown"
customer reviews on "Saver-pack Scratching Board, Cat Furniture Orbit + Satellite 2.0 - walnutbrown"